Knowing what patients want and then providing them with exactly that is key to the success of any cosmetic dental practice. Basic economics here, folks. When there is a demand for something, every business wants to be the one to supply that special something. 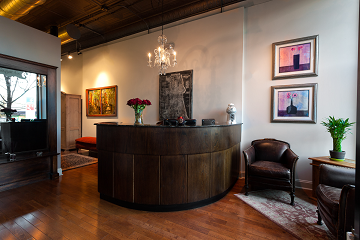 Located on the North side of Chicago in the lovely neighborhood of Lakeview, Sugar Fix Dental Loft strives to create a comfortable office environment that puts patients at ease the moment they walk through the front door on North Paulina Street. The ambiance of our office sets the bar high when it comes to the dental experience. Once you set foot in the lobby of Dr. Jessica T. Emery’s boutique cosmetic practice, you will never want to go anywhere else for oral care. Upon checking in at the reception desk, Tricia Nardi, Karina DeBus or Dr. Emery herself will greet you with the warmest smiles imaginable. You will be offered something to drink. Water, sparkling or still (in cute little bottles, no less); IZZE sparkling juices; Gatorade; an organic tea selection; and coffee. Please note that this doesn’t mean you’ll have to wait long if offered a beverage. Unless you arrive for your appointment extremely early, you won’t even need to take a seat before being brought back to your exam room. So take that drink to go if you want! Thursdays are when Dr. Emery conducts her more complex cases, which might lead to numbness. No worries. A Starbucks Smoothie (Chocolate, Orange Mango, Strawberry) can be reserved for you. We don’t mess around here, people. During your exam, procedure or routine cleaning, Sugar Fix distracts you from the technical goings-on inside your mouth when Dr. Emery or her clinical assistant Laney Judson are doing what they do best. We draw your attention to the monitor positioned in front of you for some good old fashioned entertainment. Our menu now issues Netflix, Apple TV, music and movies straight from iTunes, whatever your heart desires! Not in the mood for music? Perhaps you don’t want to hear the buzzing from your teeth being polished. Perfectly understandable if you prefer not to hear Dr. Emery hard at work. Bose® noise canceling headphones are at your disposal if you would rather enjoy your dentist appointment in silence. Have we enticed you to come by and meet our team? Sure hope so! Call Sugar Fix Dental Loft today at 773.883.1818 to speak with Dr. Emery to learn about her Chicago cosmetic dentistry practice. Loft hours: Tuesday/Wednesday 8am-6pm and Thursday/Friday 7am-3pm. We would be honored to have you join our practice.